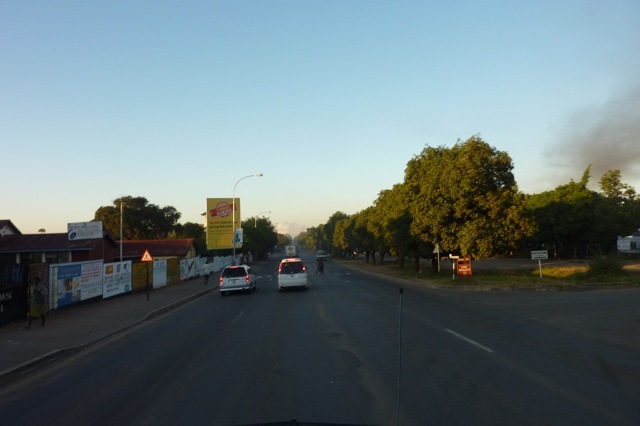 The dark, wide streets of Lubumbashi are empty at five in the morning. My taxi driver and I headed to the airport in silence. He was probably groggy, though he was sharply dressed in a crisp white shirt and pressed trousers. I'd worried he wouldn't show up and I'd be stuck, alone in the procure courtyard but for the frogs and the burbling fountain. 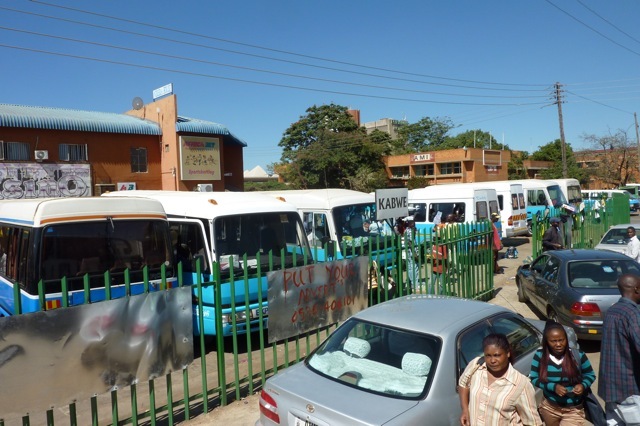 No taxi driver cruises the church for five a.m. fares in Lubumbashi. I was alert and nervous. My contraband Tintin carvings were camouflaged in my backpack, hidden under layers of jacket and towel, while my clothing was folded into a zippered plastic bag. Would the Lubumbashi airport security guys be as jackass-y as the Kinshasa ones? If I could get my carvings to Zambia, I was home free. I could post them home from Livingstone, where tourists sending home souvenirs is not just normal, but is greatly encouraged. Zambia loves tourism. 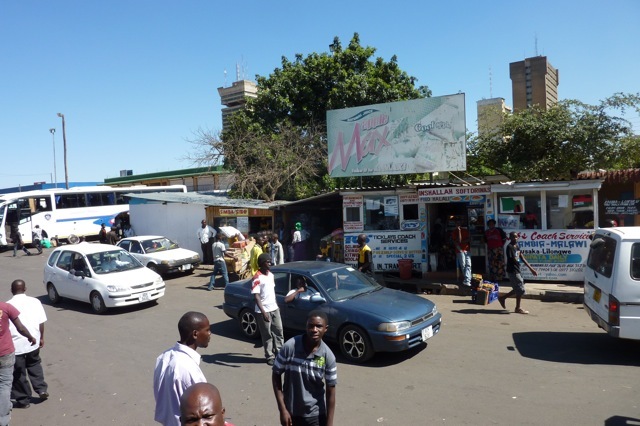 When Zimbabwe's government went whacko, Zambia welcomed its farmers with open arms and its tourists with massive promotional campaigns. 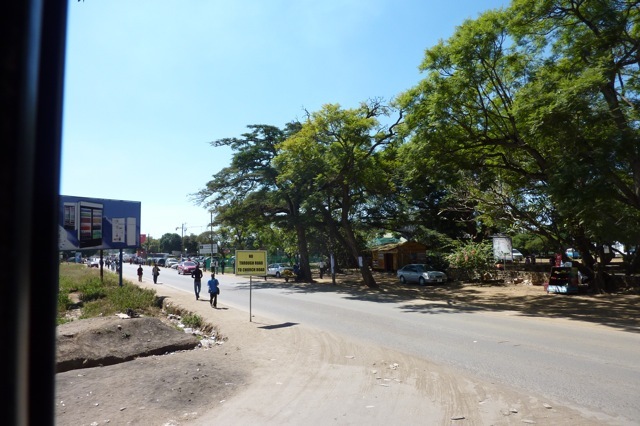 Bonus: Since my first visit to Zambia in 2001, it had experienced a public anti-corruption campaign that focused on both prevention and punishment. 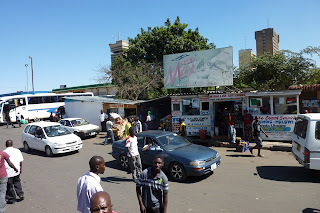 No one in Zambia was going to pretend a few Tintin souvenirs were priceless antiques in order to extract a buck from me. The Lubumbashi airport was as dark as the city had been, and some guards stirred sleepily as I entered. Maybe I didn't need to be here two hours before my flight, I thought, as one of the guards motioned to me to sit down on a bench. The airport staff slowly got to work. Where had they all been sleeping? A sleepy woman in heels descended from the mezzanine. She motioned to me to bring her my luggage. I unzipped the plastic bag of clothes first. She dug around halfheartedly and then pushed it aside. Now she pointed to my backpack. I fiddled with the combination lock. Slowly, slowly. Let her get bored. I unzipped the bag, revealing an overstuffed mass of towel and jackets. She went right for my bright yellow zippered underwear pouch. I probably looked horrified. All the guards were watching dully. I didn't know if I really wanted to give them a laugh this early in the morning. But I needn't have worried. As soon as the woman spotted the first bra, she quickly zipped the yellow bag back up. She pawed a few other things, and then about 20 Japanese tourists burst in. She pushed my luggage aside. A man and a woman were now staffing the check-in...well, podiums, really. They were just freestanding podiums in the middle of the airport lobby. I handed my passport to one, who also took my bags. I followed the Japanese tourists through a jungle-gym of lumber at the back of the airport. The gates were past a construction zone. And at eight, we descended into Lusaka International Airport. I was one of the few to get off the plane, which was continuing on to Johannesburg. I was through baggage claim and passport control in a jiffy, and was so delighted to be in Zambia that I forgot to complain to anyone that they'd canceled their visa waiver program if you had accommodation pre-booked. I tried to change my last DRC currency (the currency exchange booth hadn't been open yet in Lubumbashi) but the currency people looked at me like I was carrying rabies. So I threw it away, change fifty euros, and started asking around. "How do I get to town without paying for a taxi?" Airport taxis aren't cheap in Lusaka. There was a bus, I was told, but I'd have to walk outside of the parking lot perimeter, past the security gate. Groan. I tried another option. Air Zambezi has last-minute day-of-travel standby fares. Only $50 to Livingstone. That's only about $25 more than I'd spend on the taxi to the bus terminal, then I would still have to buy my $13 bus ticket. The $12 hardly seemed worth scrimping on. "You could try it, but there are only three seats today," came the bad news from the booking agent. "It's quite possible you'll get on, but you're the lowest priority. If anyone else needs the seat, you won't get to Livingstone today." Enough of the airplanes. I made a deal with a taxi driver and headed into town, along a fantastic new road that had been a gift from Japan. We passed a huge shopping mall. "I think I went there in 2005," I told the taxi driver—I was enjoying having a coherent conversation in my native language. "But it didn't look like that." "They built onto the mall," he explained. "It's much bigger now." 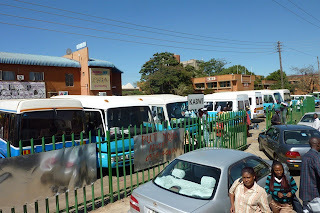 The Lusaka long-distance bus terminal is fairly organized, with one section offering domestic buses and the other international. But damn...my top-choice departures, Mazhandu and CR, were sold out for hours. It was 9:30, and I'd have to wait all day to go with one of these popular lines. Different bus touts led me around to different bus lines—I tried everything. I looked across the road at the mini-buses for a minute before deciding that no, I'd had enough cramming for the time being. Finally, one of the touts led me to a no-name bus company. "What time can I get a ticket for?" "One? What about noon? I don't want to get to Livingstone after dark." Livingstone is reasonably safe but I have met people who were mugged there after dark. 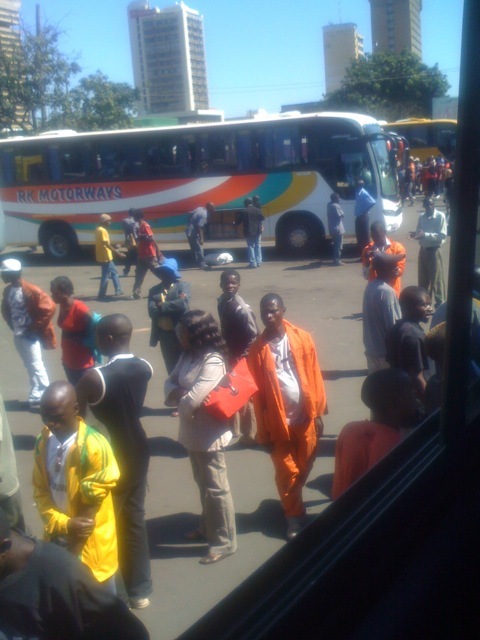 Another would-be passenger, a young Zambian woman also buying a ticket, addressed me now. "We're all in the same boat. This is the earliest you will find. I want to go earlier too, but there aren't any seats. Just buy the ticket. See, I did." She flashed her ticket. I reddened slightly and paid my fare. This was Zambia—it wasn't that someone was trying to get one over on me. The buses were all sold out for the morning. There is luggage storage at Lusaka's bus station, but the ticket seller took my luggage for free and gave me a claim check. And I headed into town. 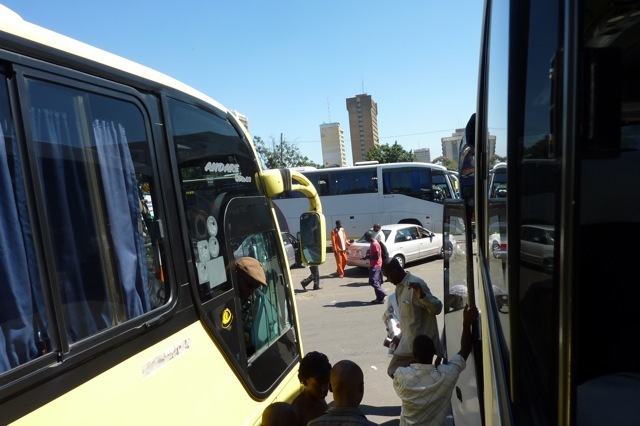 I remembered there being something weird about reaching Cairo Avenue, Lusaka's main drag, from the bus station. And there was. You have to loop around, crossing the railroad tracks at one of the overpasses before doubling back. In other words, just follow everyone else. Now all I needed was an ATM, a cup of coffee, a place to sit for three hours, and an adapter so that my laptop wouldn't run out of power. I'd been to a nice coffee shop on Cairo Avenue years ago, but unfortunately, I couldn't find it. I stomped around in frustration, trying to find somewhere nice, and then finally I asked a taxi driver. He pointed me to a fast food restaurant. I tried again, asking a different taxi driver. "There," he said, pointing at a mini-mall. "There is a nice coffee shop in there." Indeed there was a lovely bookstore/coffee shop in the Cairo Road Mall. The theme was Christian leadership and entrepreneurship—which was both intriguing and odd as I couldn't quite figure out what that meant—but the coffee was delicious. The only breakfast on offer was cookies or mini-cakes. And across the way was an electronics shop with just the right adapter. Woo-hoo, this mall even had a nice restroom, a must when you're about to get on a bus for 6-7 hours. Which I did, along with several dozen others. This was not one of the nice buses, but it did the job, though the ride seemed to take forever. Five Swedish nursing students—adorable, enthusiastic, and a little scared—approached me as we cruised into Livingstone. Did I know where Jolly Boys Backpackers was? Could I show them? Was it safe to walk? Jolly Boys is right up the hill from the bus terminal, so I escorted the five young women to the corner and pointed them in the right direction before hurrying alone to my go-to backpackers, Fawlty Towers. Which had—oh, wonderful!—renovated since I was last here in 2005. I took a lovely single en suite room near the pool, ordered a meal from the restaurant at the back of the garden, and that night, went to sleep with a smile on my face. Because I was sleeping on a spring mattress, under a comforter and clean sheets. No more sagging mats for the moment.